Since his arrival in 2016, Stuart Webber has reinvigorated a football club that appeared directionless. It was also a club saddled with a squad of players on bloated wages and which reportedly had the Championship’s second-biggest budget. But culture and philosophy are buzzwords that have been at the fore of Webber’s reign. Change is infectious and merely stepping into the club’s Colney Training Centre illustrates that. In physical terms, a new building is being constructed as part of the academy bond scheme that was so successful but there’s also a marked change in terms of the atmosphere. There’s a definitive buzz around the place, inspirational quotes, neat taglines and smart offices accompany some now-excellent footballing facilities. Not all are associated with Webber’s arrival, but it’s clear that any sense of self-importance or hierarchy has been eroded and replaced with togetherness and positivity. From a club lost and looking in the mirror without any sense of its own reflection, a metaphorical phoenix has emerged and swept through the club. After the disappointment of that first season back in the Championship, and the resultant baggage, something drastic needed to happen. There was no crisis or power struggle, but there was a recognition that if the club followed its current path it could lead it to stagnation or worse. Norwich City elected to be proactive and appointed Stuart Webber. Upon his arrival, this football club resembled a teenager; one that lacked identity and self-belief yet possessed an unwarranted sense of self-importance – a not uncommon trait of relegated sides. The barriers in the way of Webber and co were enormous but the fruits of their labour are beginning to shine through, both on and off the pitch. Folk have departed, including three footballing heads of department, some first-team players and other once-key members of staff and what’s left is a club who is pulling in one unified direction. “We’ve not done anything here that’s revolutionary. We’ve just aligned a few things and put a few processes in place and set some general ground rules regarding the culture and what we expect from them. “The club had probably just lost its way a little bit. It had gone through a period of managerial change, of relegation and changes at executive level in terms of the chief executive coming and going in quite a quick succession. “It was a club that needed to settle down, find it’s feet again, re-focus and move forward again. Does it look different? Yeah, but it’s not rocket science what we’ve done”. This is now a football club that’s radically different from the one inherited by Webber and Daniel Farke, and it’s apparent the changes installed on the footballing side have impacted on the current state of the club. “You’ve got to affect people’s behaviour. That’s something that comes from the top from the ownership. What are the acceptable behaviours within our organisation? From there, it’s about delivering those behaviours every day but it’s also about how you act. “We represent our club, our organisation in a certain way and that’s where it had to start. “After that, we had to identify people who would, maybe, stop our culture becoming what we wanted and remove them from the business, whether that’s on the playing side or the non-playing side. “Fundamentally, a lot of the people who left the club didn’t fit in with where we wanted the club to go. You either change or change the people. It’s as simple as that. “It hasn’t been easy, but you now walk into an environment in which people believe they can grow, get better, support each other, feel open or can they can question and challenge. We’ve tried to create an environment where people come into work with a smile on their face but also don’t feel afraid to make mistakes and know they aren’t going to be hung out to dry for doing that”. Culturally, the club is one that encourages education and risk-taking – be it on the pitch or off it. Intrinsic in creating this new culture, Webber recognised the importance of having one that allowed freedom of expression rather pressurised improvement. And if you consider the youthful makeup of Norwich’s current first eleven, it’s clear it’s a change that was welcomed by all in and around Colney. Installing this newfound culture could provide the club with both longevity and consistency, but it’s not something that was constructed overnight. “When I first joined, I spoke about needing time, that wasn’t something to buy me a long time of staying in a role, but it was genuine. You can’t just parachute people in and go ‘change your behaviours and start acting like this and everything will be great. “It takes a long time to build a culture up. There’s a realism in the manner Webber delivers this verdict. For some, complacency and over-confidence would creep in. Not for Webber. Not for Norwich City. All those key figures on the football side are constantly thinking about improvement and long-term sustainability rather than thinking it’s job done. Many would forgive Webber for taking his foot off the accelerator and focusing on the short-term goal of you know what. Yet, still, he holds “heated” meetings with Steve Weaver about the academy, but with conversation and communication replacing hierarchy and shows of strength. He is a self-proclaimed workaholic, somebody who’s unwilling to settle for mediocrity. “I have certain ways of working and hold certain beliefs about how I think a football club should be run in terms of the football side of the business. “Yes, I’m open-minded to develop that but I’m also convinced by it. When you are convinced by something, you need the people around you to be convinced by it as well. By all means, they can challenge it, absolutely. “It’s not around having people who are yes men, but it’s about having people who see work the same way as you. There are certain teams we’ll play who we’ll identify how they play football and go, ‘that’s not for me’. “I truly believe in young players. I don’t want to watch a team of 30-year-olds, even if they win the league. It’s not for me. I want to see young players developing and getting better. To build a club, you build it through young and ambitious people. Of course, you need experience as well, for every Buendia you need a Tettey. Ensuring the culture is engrained is integral in the long-term future of this club. Other clubs have promised to embark on a bold new adventure only to and abandon it and revert to type a mere matter of months later. But this feels permanent and should be embraced by everyone in NR1. 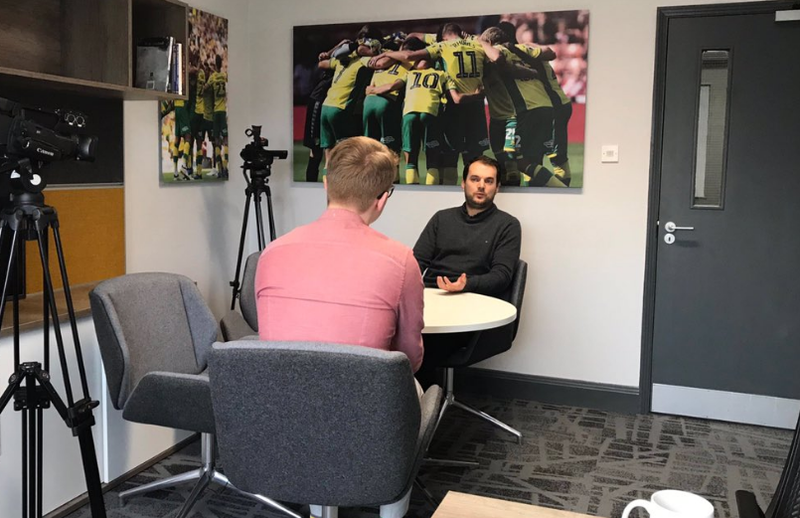 Part two of Connor’s interview will be live later this afternoon, and the full interview will be available on MyFootballWriter’s new YouTube channel from 6pm tonight. But if you can’t wait, here’s a taster. A very good read and thanks you for it. Hope part 2 is a good and it has some info on if and when Daniel Farke will get an extention.